William Hallmark art prints of Blessed are the Pure in Heart for sale painted by artist William Hallmark. The Scripture caption is Matthew 5:8. Please allow 3 weeks delivery time for this canvas option. This canvas comes with standard stretching. 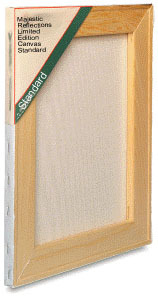 Add $50.00 for Museum Stretching (no staples visible from the sides). Add $40.00 for application of clear acrylic brushstrokes. This adds realism to the artwork by raising the surface of the canvas to simulate the various thicknesses of oil paint found on the original canvas. We are reminded of the innocence of children with this painting, Blessed are the Pure in Heart. Jesus said that unless a person receives the Kingdom of God like a little child, he or she cannot enter into it (Mark 10:15)! 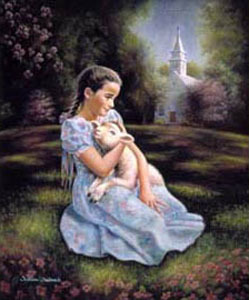 It is those who have a pure heart, like a child's, that will see God. The Scripture caption reads: "Blessed are the pure in heart: for they shall see God" (Matthew 5:8). 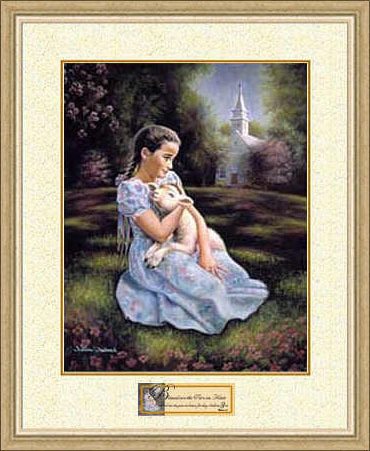 Blessed are the Pure in Heart copyright© by William Hallmark is prohibited from being copied. 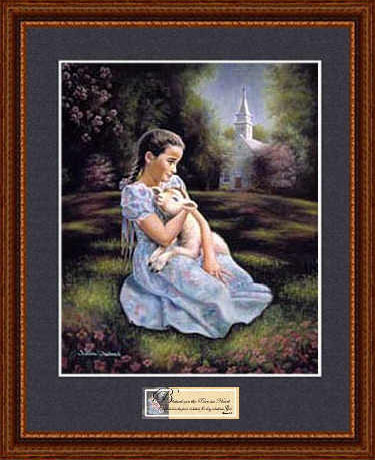 William Hallmark art, Christian art, gifts, artwork, art work, prints, photos, paintings, pictures, and prints of Blessed are the Pure in Heart by artist William Hallmark for sale. Blessed are the Pure in Heart by artist William Hallmark can be purchased at special sale prices at Christ-Centered Art.